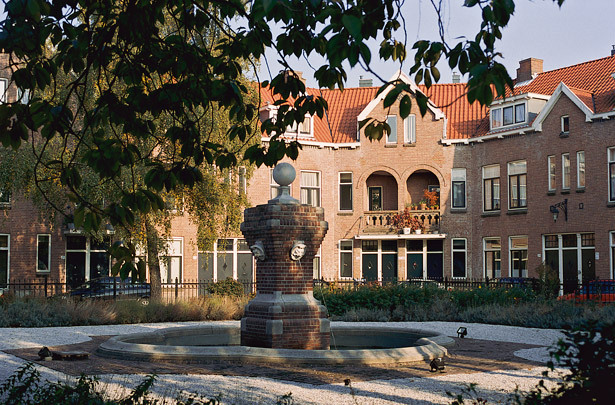 Hidden behind Hillevliet with its main entrance on Jasmijnstraat is Patrimonium's Hof, a housing project dating from 1916. A gateway in the facade leads to an enclosed courtyard containing a communal ornamental garden complete with fountain. The 168 dwellings were built for the Rotterdam housing corporation of that name founded in 1913. These dwellings were an enormous advance on 19th-century jerry-building in terms of hygiene, although many residents regarded the box beds in the living room as an eyesore. In 1992 Patrimonium's Hof was renovated, which included replacing plastic window and door frames installed at one point with wooden ones and introducing modern conveniences to what were now 103 units (the result of combining pairs of dwellings).